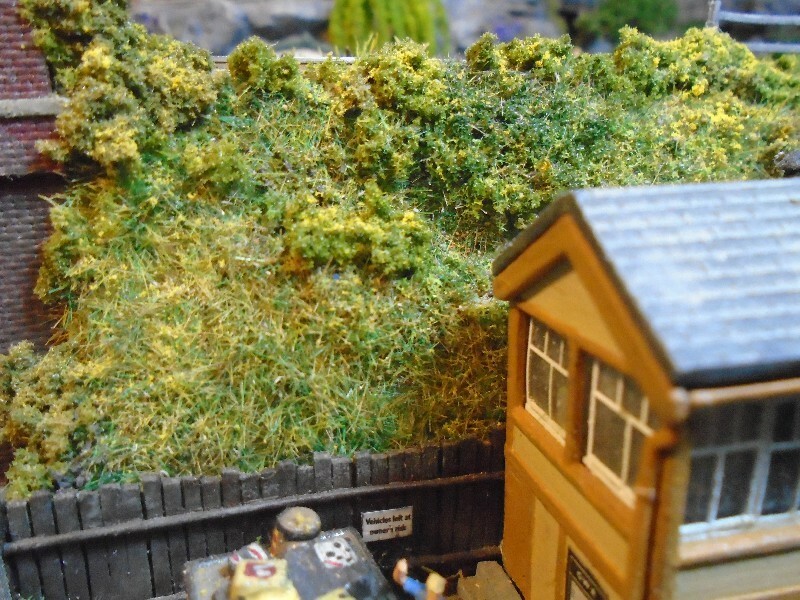 I'm sorry if my question has been covered elsewhere, but I wanted to ask if anyone thought that 4mm and 6mm static grass fibres look too long on their layouts on things like grass embankments or fields? I used 2mm and the static grass effect wasn't too effective for me. When it had dried, I tried a slightly different colour with 4mm static grass, and that looked ok. Then I think I ruined the whole thing with 6mm static grass. Before I scrape off the whole lot and try again, does anyone agree that 4mm and 6mm are too long, or maybe just 6mm too long? I know it's my layout and what I say goes, but I wondered if anyone else had their opinion. 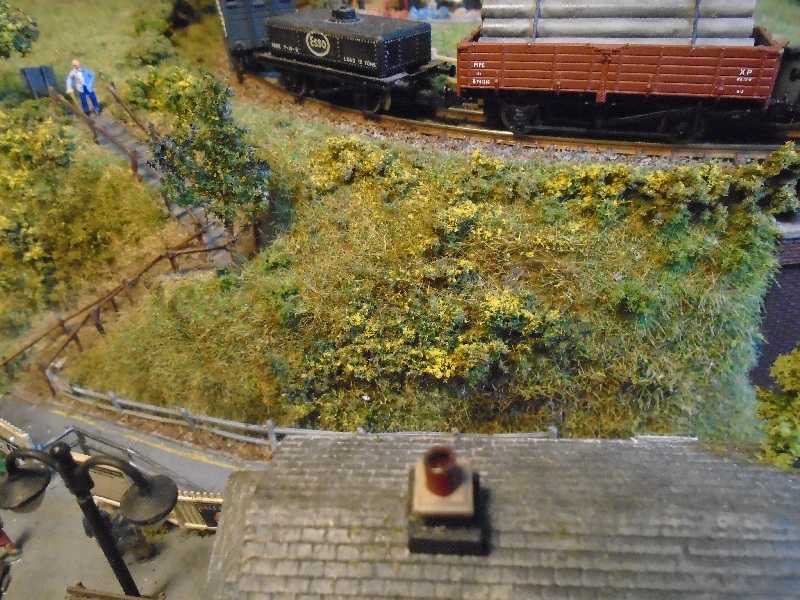 I use largely 2mm static grass with some 1mm areas (eg lawns or clse cropped fields). 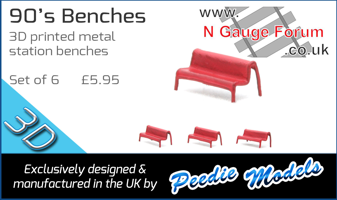 I have used 4mm sparingly for rough ground but 6mm only in very small areas next to walls or in wild areas. I think 4mm looks fine on embankments. 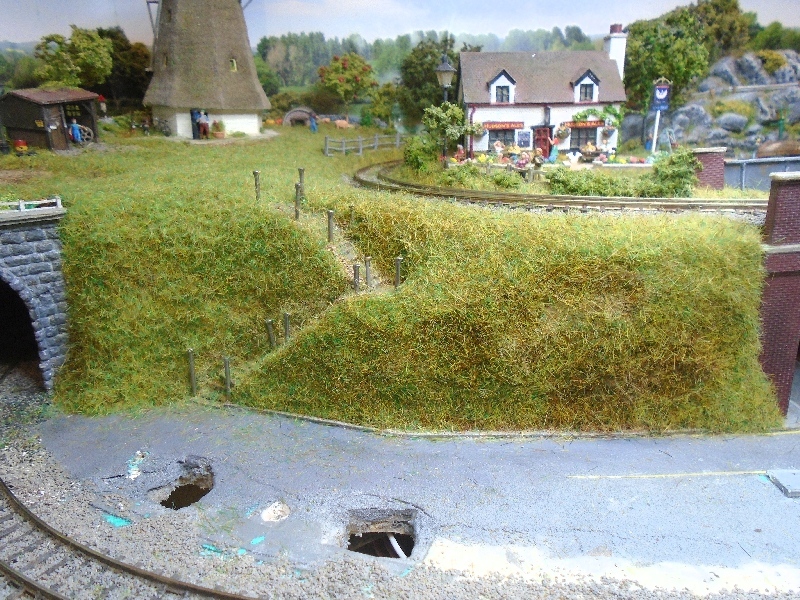 There are two embankments on my little layout, and I have used 4mm on both, with various scatters, and bits of clump foliage added. I will try and get some photos of the embankments for you tomorrow, and check what colours I used. I'd like to see photos Kevin. I think sometimes as well, that grass can look "too green", and so I'd use different shades. Is that what you did? Oh I mix spring green and summer green in varying amounts to get some variation on colour.. Even then some colour washes over the top have been used..
Do you mean colour washes as in green, grey or brown inks? That's a good idea which I hadn't thought of previously. 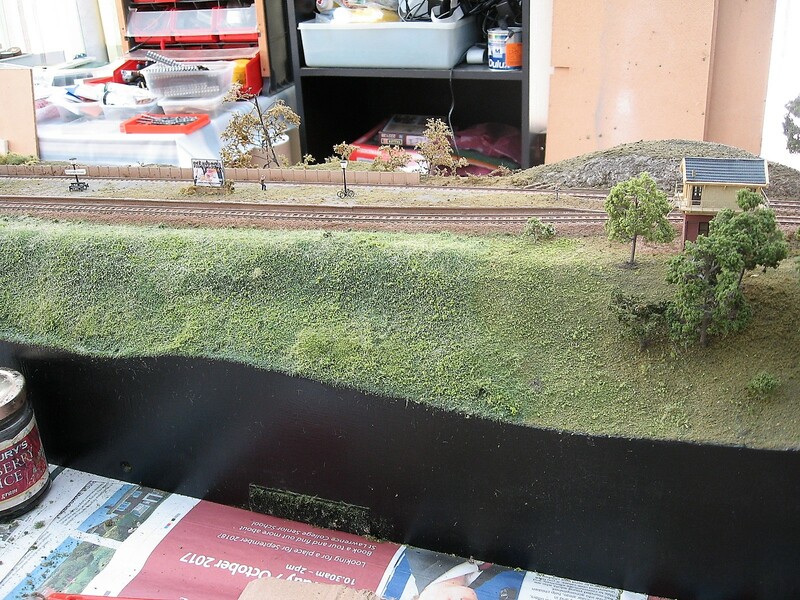 I added the longer grass on the main embankment, leaving the 2mm at the bottom, and in areas where in reality it would be easy to keep the grass trimmed. I used a stiff paintbrush to jiggle the grass around so it was not all growing in the same direction. That is really nice work Kevin. You and the other guys have encouraged me to persevere and have another go. I do think I need to scrape off what I already put down though and try again! When I first started to use static grass, I gave it a try on an old piece of plywood. Might be worth having a practise with various lengths and colours of grass brfore you go live again. Must admit until recently I've not really been a big fan of static grass, preferring to use the foam granule type of material (Woodland Scenics etc.) 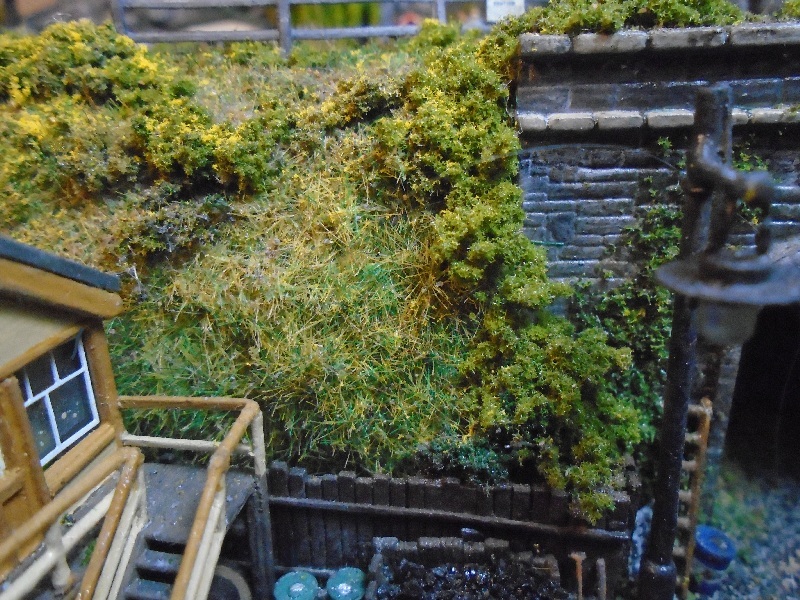 I've traditionally totally soaked my "grass" in dilute PVA to create good solid scenery on the front edge of my layout capable of withstanding little fingers at exhibitions! A few months ago I decided to update some of the scenery with a bit more texture. Here's one part, now using a combination of the foam granules with various lengths and shades of static grass. 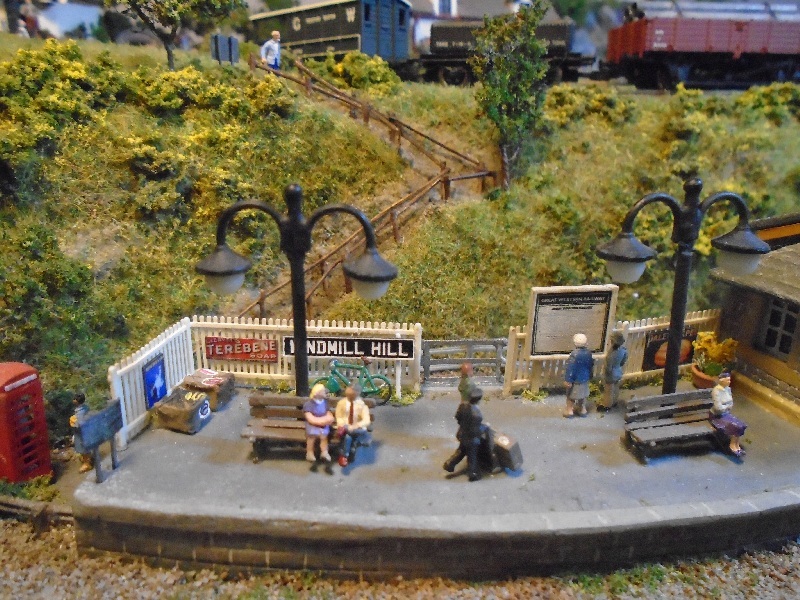 This was taken before adding fences, hedges, trees etc. On the right under the trees the "grass" is still the original texture from 2006. I'm glad my hobos have inspired you to add the scene to your layout as well! I just looked at your photos on your layout. 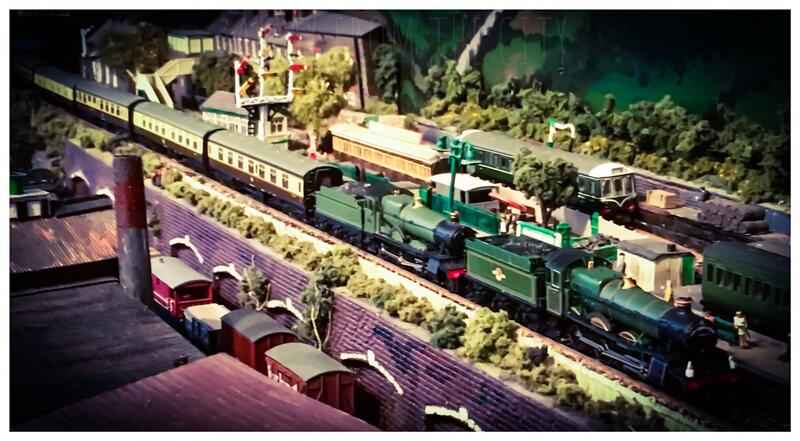 Those guys need to watch out for trains coming round that bend! 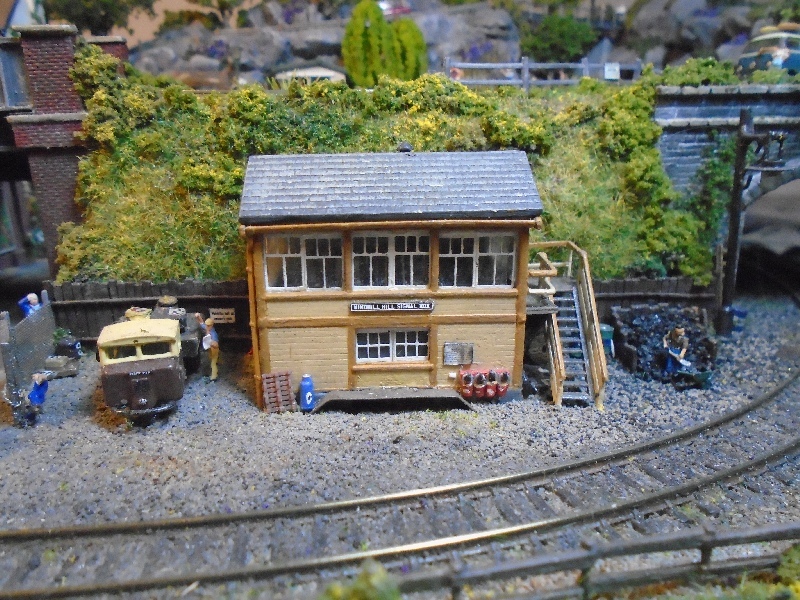 I decided my own layout's scenery needs updating as it's mainly just traditional flock powders and lichen right now. These newfangled tufts and static grass are taking some getting used to!! !